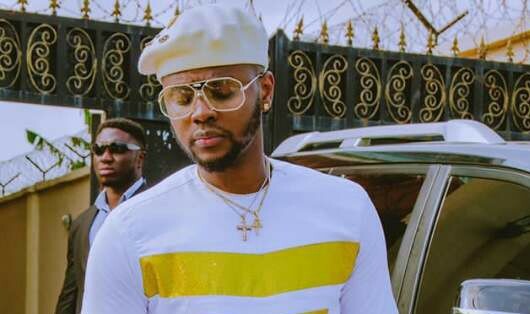 Nigeria pop star Kizz Daniel has shocked the music world by beating the likes of super stars like Wizkid, Beyonce and Adele to grab the top spot on iTunes with his new music album which has been declared the best in the world at the moment . His second studio album, ”No Bad Songz” was released in the early hours of Friday, November 30, 2018. The singer has grown major leaps since he released his debut album, ”New Era” in 2016. Without help from any A-list artiste, Kizz Daniel then Kiss Daniel forced the attention of the industry towards his direction with chart topping singles like, ‘Woju’, ‘Laye’ and ‘Mama’. The album itself was adjudged in some quarters as a near classic cementing his name as one of those who succeeded at the first time of coming out. The Nigerian music star, Kizz has taken to his social space to blow his own horn about the success of his album, which top the world chart on iTunes upon release. He has declared it the best album in the world because of that and tbh there are no bad songs on it, goan listen to it. He graduated from Federal University of Agriculture, Abeokuta, in 2013, with a degree in Water Resources Management and Agrometeorology (Water Engineering). While in university, he decided to pursue music as a career alongside his studies. A lot has however happened since that time. From his well documented contract situation with former label G-Worldwide, to setting up his own imprint, ‘FlyBoy Inc’, changing his stage name and having unbridled control over his features, the boy has fully grown and this much has been witnesssed in his music. 1. ‘Gods’ – There is something about Kizz Daniel and his opening songs. On his debut album, the first track was called ‘New King’ and now he takes it a step further opening the project with a dedication to the gods. The song begins with a comical stutter, the beat is banging and Kizz is talking his talk. This is that braggadocious and swaggy ‘walking through your hood’ to reintroduce myself kind of talk. This is that type of music that reminds you of a traditional setting where liquors are poured on the floor to pay homage to the gods. A confident way to kick things off and announce his return. 2. ‘No Do’ – The pre-released record still bangs hard, the perfect motivation anthem for that Nigerian hustling to break bread. 3. ‘Tere’ ft Diamond Platnumz – There is an African party on the horizon, with the production exploding into a wide range of waste shaking riffs. ”I no want Chioma, I no want Sarafina”, not really sure if there is any connection to Davido’s girl or that South African movie here but this is a banger and Diamond’s vocals complements his quite well. His verse is sweet and they somehow work this to become a sweet pop tune. 4. ‘One Ticket’ ft Davido – Jam! Jam!! Jam!!! Warning: no matter how many times you have heard this song before, you will have no choice but to bop to this. Can we talk about how Davido delivers one of his best guest verses of the year or the madness that MajorBangz brought on the production? Tempted to put this on replay. 5. ‘Oyibe’ – ‘Shabalistical’, every time we have heard this signature intro on a song this year, that song was a hit back to back. I like the highlife feel to this. He is talking money, another one in the long list of mainstream songs. I wish he did more with this. 6. ‘Time No Dey’ – Reggae music is in the building. This is interesting, he is building up a story, his vocals are filling me with joy. He keeps the verses quite short. I can envision him performing this song with a live band and the crowd going wild. Good record. 7. ‘Maye’ – Slow buildup, Kizz is soaring, that comical voice that has become a recent feature on his songs is back. This song sounds like ‘Time No Dey’ Part II, he even mentions it in his lyrics. The drums damnnn, Mid tempo tune, why is this giving me some deja vu of ‘Jombo’ on his first album, a slower version that is. 8. ‘Bad’ ft Wretch 32 – UK artist Wretch 32 is the featured act on this. Kizz is actually singing. Wretch is rapping and singing, killing this. This is that music that you play when you want to convince someone’s daughter to give you her number, then something more. Another favourite. 9. ‘Ghetto’ ft Nasty C – I like this, telling the story of the streets, the hood side of him finally showing. Nasty’s verse is smooth, this kid is brilliant, whether rapping or singing, he makes it seamless. There is no rush to their verses, but the message packs a punch. 10. ‘Somebody Dey’ ft DJ Xclusive & Demmie Vee – We just had to have that ‘shaku shaku’ song added to it. Despite his best attempt at colouring it, this still comes off as something you have heard many times this year, packed with dreary lyrics, not for me. 11. ‘Ayee’ – This song is confusing, comes off as simplistic and bare. There is something about the beat that pushes you to listen to the end, might grow after multiple listens but not really working for now. 12. ‘Happy’ – I like the way the drums and keys are coming off. This is good. Kizz is vocally doing all sorts, gentle but enticing, not too pop clean but pretty smooth. This is an elite level of toasting and he comes through quite well. 13. ‘Ja’ – Wasn’t prepared for the ominous instrumentals, Kizz is on that Yoruba tip, talking about elections and PVC, how to live right and packing all sort of sermons in this 2 minutes banger. The haunting background chants and drums make me feel like I am in the midst of one African tribe during a new year festival. This bangs.